Patent attorneys are engineers or scientists. After studying their chosen technical or scientific subject to at least Master’s level at a university or a technical college, patent attorney candidates complete three to four years’ practical training at a patent law firm or in the patent department of an industrial company. During their training, candidates acquire the knowledge necessary to practice as a patent attorney. Everyday working life is very varied for a patent attorney. They have regular contact with inventors, development managers and directors of companies of various sizes. Each of these companies has one thing in common – through their innovations, they want to secure a developmental edge over the competition. This is where the patent attorney comes in and, with their assistance, the development of suitable intellectual property rights strategies and the preparation and filing of the necessary intellectual property rights applications can be ensured. This assistance could be related to securing patents or utility models for technological inventions or to design and trademark applications that can also contribute to the protection of a client’s intellectual property. Due to their training being both technical and legal in equal measure, patent attorneys serve as an interface between the technical and legal worlds. This means that a patent attorney is at home in each these worlds and may have to mediate between them. In relation to the enforcement and defence of intellectual property rights, a patent attorney also represents their clients in court proceedings. For many decades, dompatent von Kreisler has been investing a significant amount of time and energy in the training of future patent attorneys. 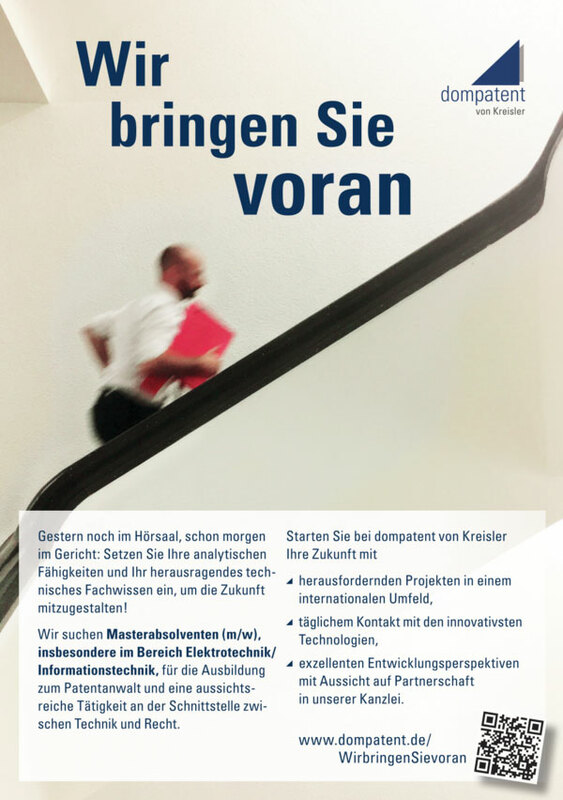 Many of the firm’s partners are involved in training European patent attorney candidates (for example, at CEIPI courses) and German patent attorney candidates (particularly as tutors in the “Arbeitsgemeinschaft der Patentanwaltskandidaten”). All partners at dompatent von Kreisler completed their own patent attorney training with us in-house. New candidates are specifically selected and trained with a view, after successfully passing their patent attorney exams, to working at dompatent von Kreisler and potentially becoming a partner in the future. Take this opportunity and apply to our company. We look forward to getting to know you. If you have any questions about the patent attorney training or your future prospects, patent attorney Florian Krüger will be happy to help you. If you would like to talk to a current candidate, please contact Thomas Henzler; having graduated with a degree in engineering from RWTH Aachen University, he is currently training with us to become a patent attorney . If you have any questions about the application process, please contact Ms. Sanija Shekarpuri or Ms. Elena Mai of our Human Resources team.